European starlings (Sturnus vulgaris) often form huge flocks of upwards of 3,000 birds. European starlings (Sturnus vulgaris) were introduced to New Zealand to control local insect populationsEuropean starlings (Sturnus vulgaris) were allegedly introduced to the U.S. as part of a movement to introduce all the birds of Shakespeare to the States.People may move European starlings (Sturnus vulgaris) to new areas by taking their pet birds with them.Introduced by acclimatisation societies. Principal source: Long, J. L., 1981. Introduced Birds of the World. Reed, Sydney. 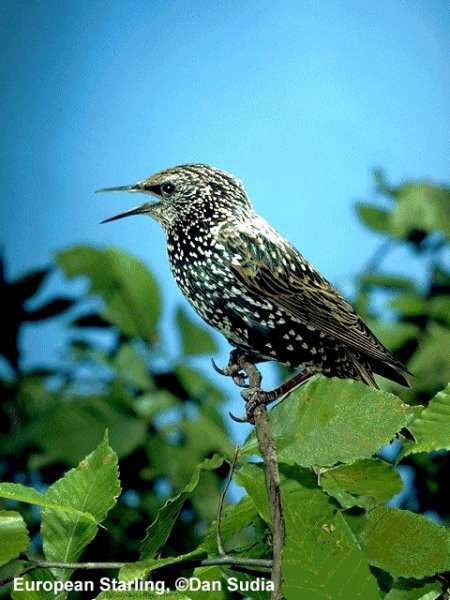 Recommended citation: Global Invasive Species Database (2019) Species profile: Sturnus vulgaris. Downloaded from http://www.iucngisd.org/gisd/species.php?sc=74 on 22-04-2019. European starlings (Sturnus vulgaris) cause damage to agricultural crops. When significant numbers are present starling flocks may descend on fruit and grain crop fields to forage, causing massive damage and can have a heavy economic effect. European starlings are extremely aggressive omnivores, and will compete with native fauna for food. Open bill probing is most commonly used for ground invertebrates, which is their preferred food. Hence this provides the European starling with an evolutionary advantage over frugivores. Fruit damage is often found to be caused by a higher proportion of juveniles, which have underdeveloped probing skills. Usurping nests by contamination (as well as physical competition) is also a major problem (e.g. native parrots use little, if any, bedding, whereas starlings will rapidly fill and contaminate tree hollows). European starlings are also a public nuisance and can damage infrastructures, roof linings, etc. and negatively effect aesthetics (Weber 1979). Physical: Manual methods such as exclusion, trapping, and shooting have been employed in an attempt to control European starling (Sturnus vulgaris) populations. Mechanical controls include scaring with the use of sonic devices. (Adeney, 2001; Kern, 2003). Informations on Sturnus vulgaris has been recorded for the following locations. Click on the name for additional informations. Airola, Daniel A; Grantham, Jesse. Jones and Stokes, Purple Martin population status, nesting habitat characteristics, and management in Sacramento, California Western Birds. 34(4). 2003. 235-251. Summary: Impacts of Starling population on purple martin population. James, Francis C. 1997, Nonindigenous Birds. Pages 139-156 in Daniel Simberloff, Don C. Schmitz, Tom C. Brown, editors. Strangers in Paradise Impact and Management of Nonindigenous Species in Florida. Island Press, Washington D.C. 360 pp. Kern, William J. 2004. European Starling. Summary: A website with basic ecology information as well as economic and health impacts of the starling. This site also details several methods of control. Timmins, S. M. and H. Braithwaite, 2002. Early detection of invasive weeds on islands. In Turning the tide: the eradication of invasive species: 311-318. Veitch, C.R. and Clout, M.N.(eds). IUCN SSC Invasive Species Specialist Group. IUCN. Gland. Switzerland and Cambridge. UK. Summary: Notes on starlings as carriers of avian influenza virus. Summary: Review of the confirmed and potential human health risks of pigeons, starlings and sparrows. Summary: This document seeks to inform Western Australians about the threat posed by starlings, with the hope of increasing community surveillance efforts and reporting of starling sightings. Adeney, Jennifer Marion. 2001. Introduced Species Summary Project: European Starling (Sturnus vulgaris). Summary: A website with good information on ecology, and control methods of the starling. Contains several photos of starlings as well. Available from: http://www.columbia.edu/itc/cerc/danoff-burg/invasion_bio/inv_spp_summ/Sturnus_vulgaris.html [Accessed August 11, 2004]. Chipper Woods Bird Observatory. 2004. European Starling: Sturnus vulgaris banded 12 December 1998. 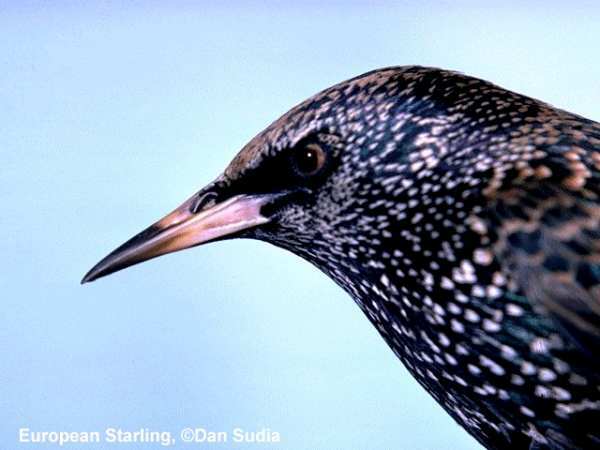 Summary: This site has detailed photographs of starling morphology. Summary information on basic ecology and conservation efforts is also included. Chow, J. 2000. Sturnus vulgaris (On-line), Animal Diversity Web. Summary: This comprehensive sight reviews ecology and impacts. It contains several good images as well. Available from: http://animaldiversity.ummz.umich.edu/site/accounts/information/Sturnus_vulgaris.html [Accessed August 11, 2004] . Clergeau P., 1986. L��tourneau sansonnet. Payot Lausanne ed., Lausanne. CONABIO. 2008. Sistema de informaci�n sobre especies invasoras en M�xico. Especies invasoras - Aves. Comisi�n Nacional para el Conocimiento y Uso de la Biodiversidad. Fecha de acceso. eNature.com, 2007. European Starling: Sturnus vulgaris. Georgia Wildlife Web. 2000. Perching Birds: European Starling, Sturnus vulgaris. Accessed August 11, 2004. Gulf States Marine Fisheries Commission (GSMFC), 2003. Sturnus vulgaris (Linnaeus). Summary: This site has a short summary of physical description, potential impacts in the local area and basic ecology of the starling. Available from: http://nis.gsmfc.org/nis_factsheet.php?toc_id=212 [Accessed August 11, 2004]. Summary: Journal article of a study done to gauge the effects of European starling on the native populations of cavity nesting birds. Komdeur, Jan, P. Wiersma, M. Magrath. 2002.� Paternal Care and male mate-attraction effort in the European starling is adjusted to clutch size. Proceedings: Biological Sciences 269(1497): 1253-1261. Summary: Study done to determine differences in male starling mating behavior in relation to clutch size. And parental practices of male starlings when polygynous. Summary: Study done of starling behavioral aggression with numerous individuals in a confined space. Summary: Journal article of a study done to monitor the effects of agricultural land use as a correlating factor with decline of several bird species including Sturnus vulgaris.